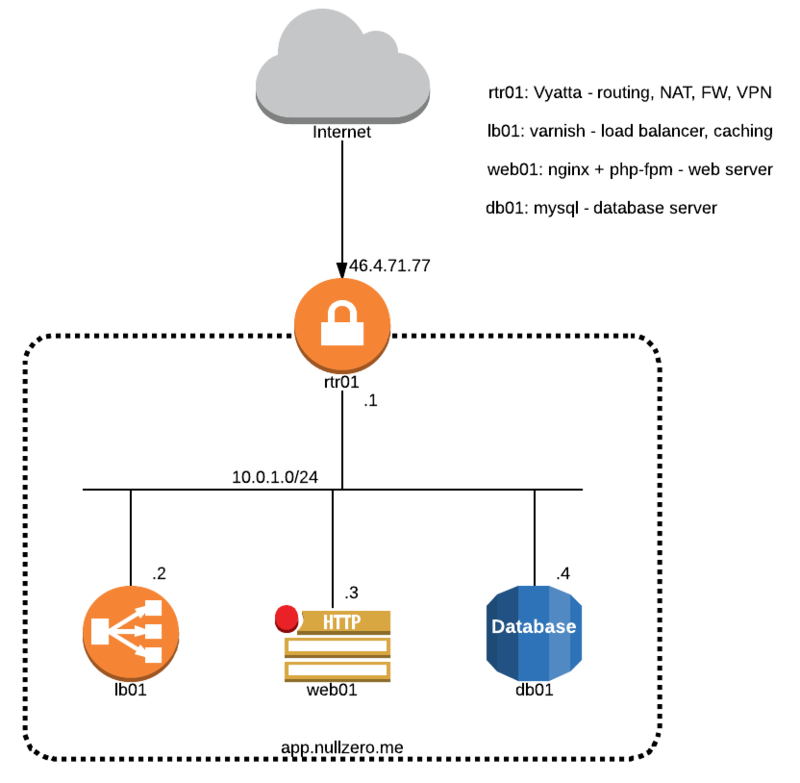 In this post I’ll show how you can build a secure virtualized infrastructure for a basic webapp. We will break the setup into VMs that provide isolated services. You can find below the infrastructure diagram. The followings steps will show how you can set up a bare-metal server running Debian Wheezy to act as a KVM hypervisor and the process of deploying and configuring the VMs and the services they are running. The management IP address of the hypervisor and the other public IP addresses are assigned on the same interface by the hosting provider. In order to provide Internet connectivity for the VMs we need to create a bridge containing the physical interface where the public IPs are routed and add the VMs ports to this bridge. The trouble is that since this is also the management link we’ll lose connectivity after adding the physical interface to the bridge. After this operation we need to assign the management IP address to the bridge interface. For doing this we’ll edit the /etc/network/interfaces file. -        xml += "      <virtualport type='openvswitch'/>\n"
We can now create the VM and start the OS installation. We’ll first install the rtr01 VM as it will provide Internet connectivity for the rest of the VMs in the internal network. The following command will generate a VM called rtr01 with 4 vCPUs, 4GB of ram, storage file located at /var/lib/libvirt/images/rtr01.qcow2 and 2 network interfaces - one in the bridge connected to the Internet and another connected to the internal network, the console is presented over VNC and it will first boot from the cdrom device loaded from the /var/lib/libvirt/images/vyatta-livecd_VC6.6R1_amd64.iso file. The disk and network interface will use paravirtualized drivers to obtain increased I/O performance. set interfaces openvpn vtun0 openvpn-option "--comp-lzo --mssfix --tun-mtu 1488"
After completing these steps we should have a working router, firewall and VPN server. After completing the OS installation we have a fresh running Debian Wheezy system. We don’t want to repeat the install process for the other files so we’ll just copy the existing image of the Debian system and modify the IP settings and hostnames. We first copy the base image, then attach it by using qemu-nbd, mount the partition where the file system resides and then edit the files that we need. After this final step we have our setup ready and http://app.nullzero.me/ should show the Hello World!